Eastern European region is the second payment growing market? Eastern European region is the second payment growing market of any region in the world in terms of growth and value of payments made using payment cards for the past five years. Growth in the region is mainly supported thanks to the popularity of debit cards, mainly payment card Maestro. Fraud, however, continues to deliver hassle card users. What is the potential for the development of Eastern Europe? 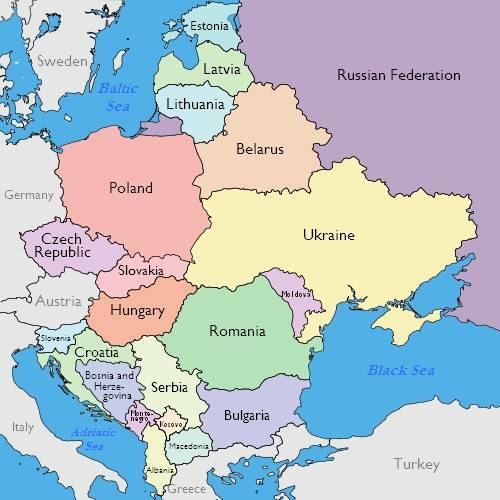 For Eastern Europe, as stated in the UN, include the following countries: Belarus, Bulgaria, Romania, Czech Republic, Hungary, Moldova, Poland, Russia, Slovakia, Slovenia and Ukraine, unfortunately, the Baltic countries are not included here. It should also be noted that in this region there are more than 131 million active Internet users. The total amount of all transactions in e-commerce, equal to 20 billion euros, is still very low compared to the three big markets in the UK, Germany and France, which account for 70% of all transactions in e-commerce in Europe, which in monetary terms is 175 billion. The total volume of transactions in e-commerce in Eastern Europe is 9-10% of the total volume of transactions in the European e-commerce. It’s also worth noting that the trend is growing with such big markets like Russia (EUR 5 billion in 2011), Poland (€ 4.5 billion in 2011) and the Czech Republic (1.4 billion euros in 2011). Many payments are still carried out in the form of money, especially cash on delivery. But the bank transfer is often used as a method of payment. Taking a look at some of the emerging markets in Europe, you can emphasize the growing Internet activity: In Russia, nearly 40% of the population uses the Internet, of which 60%, or 45 million people are shopping online. The main regions – Moscow and St. Petersburg, it is in here in 2010, was carried out over 50% of all Russian online operations. According to these results it can be concluded that the volume of the Russian market of electronic money will grow by 50-70% in 2012. The number of active e-wallets in 2011, has grown from 30 to 34 million euros. The most important methods of payment are Qiwi (kiwi), WMG, Yandex Money, Moneta and Webmoney. Despite the obstacles, such as the long shipping time, online retailers continue to gain popularity in Ukraine. The number of Internet users in June 2011 increased from 9 million euros in the previous year to nearly 13 million. The most popular categories of products – a “home appliances” and “mobile phones”. According to yStats, income tax for companies is 21% now, but it will decrease to 19% in 2013 and to 16% in 2014. In 2010, in Poland, 24 million people used the Internet to make payments, or more than 60% of the total population. In line with this trend, the Polish company B2C E-Commerce for the first time for many years has recorded double-digit growth, which is expected to reach 5 billion line in 2012. Finally, the number of Internet users in the Czech Republic in 2010 reached more than 6 million people, and 25% of online shopping. Company B2C E-Commerce witnessed double-digit growth in 2009 and 2010, but nonetheless it was below 5% of retail sales. In 2010, more than 60% of Czech online shoppers paid for their online purchases in cash, while nearly 35% preferring the online bank transfers. And in the end, Slovakia and Estonia – the country with the highest rate of Internet use to make payments to the population of these countries. What people are buying over the Internet in Eastern Europe? The most common products bought over the Internet, include: clothing, footwear and accessories, followed by books, household goods, movies / music, travel, tickets, electronics, software, and hardware, as well as household appliances. In general, the number of countries in Eastern Europe, where the population uses the B2C E-Commerce, continues to grow. But most of the banks in Eastern Europe, which play a role in the online payment processing, belong to western companies. The number of Internet users and online shoppers is increasing steadily. However, in order to achieve Western standards of Eastern Europe must address three main issues: safety on-line payment transactions, shipping problems and postal services, trust in online shopping.